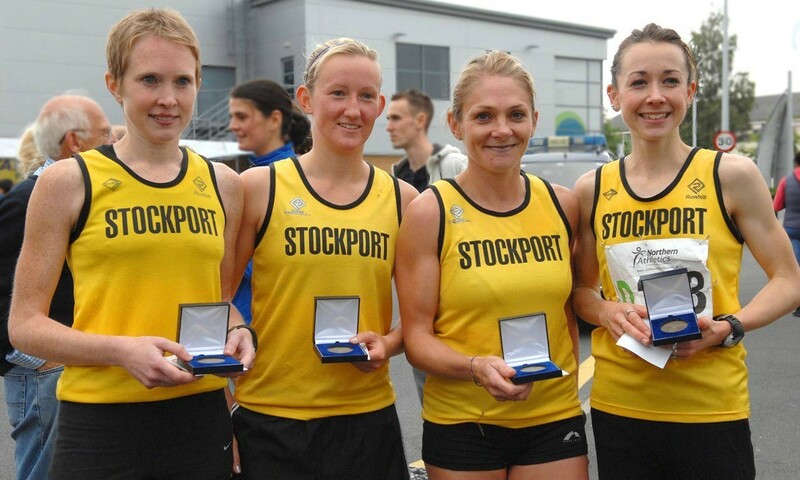 Jessica Coulson anchored Stockport Harriers women to Northern 4-stage road relay victory at Birchwood Park in Warrington on Saturday while their male club-mates made it a clean sweep in winning the men’s 6-stage event. Coulson’s final leg was timed at 20:24 as the 2012 under-23 Euro Cross gold medallist combined with Jenny Knass, Lyndsay Clarke and Louise Rudd to clock 1:33:19 and beat Leeds City with 1:34:43. Lincoln Wellington were just behind them with 1:34:47. Ross Millington led out the Stockport men with 18:23 for the first leg and a consistent series of results saw Patrick Martin cross the line in 1:52:09 as Leeds City again got the runner-up spot clocking 1:53:02 ahead of Sale with 1:54:59. Over at Birmingham’s Sutton Park and Bristol & West claimed victory in both Midland events, Birchfield Harriers and Coventry Godiva battling it out for the runner-up spot in the women’s 4-stage and Tipton Harriers pipping Notts in the men’s 6-stage, reports Tom McCook. Claire Hallissey, who clocked the third-quickest leg overall with 14:56, brought Bristol & West home in 61:12, while their club-mates secured 6-stage victory with a time of 1:49:48. Ryan McLeod elevated Tipton half a dozen places to second on the third leg of the men’s event. His impressive time of 17:21 proved to be the overall fastest performance by the significant margin of nineteen seconds. The day before she finished ahead of Paula Radcliffe at the Worcester City 10k road race, Bournville AC’s Nicola Sykes overtook no less than fourteen runners to elevate her club to fourth place on the second of four stages. In the process, she accomplished the fastest female performance of 14:52. At the Southern road relays, Aldershot, Farnham and District not only won both senior races at the two-day running festival but also notched up four age group victories, reports Martin Duff. Scott Overall ran out quickest with 17:47 in the men’s race for Blackheath & Bromley as he prepares for the Berlin Marathon this coming Sunday, while Emelia Gorecka was part of the very strong AFD women’s team who won for the ninth consecutive year. That tally was bettered by Oxford City’s M60 outfit, though, as they won their age group for the tenth year in a row. One greedy athlete – Chris Greenwood – not only anchored Kent AC to victory in the M40 race but then went on to run faster in the senior men’s race as he moved his club up to the bronze medals on the sixth and final stage. As @EliudKipchoge gets ready to return to marathon action in London, we've teamed up with @NNRunningTeam and have 3 copies of their stunning photo-led world record celebration publication (which isn't available to buy) up for grabs!